There's not another small town that can come as close to perfect as Laughlin, Nevada. Set in a rugged mountain terrain just 90 miles south of Las Vegas, Nevada and flanked by two lakes — Lake Mohave and Lake Havasu. The Colorado River runs past eleven resorts and casinos within four miles of your home making for a complete family destination. Even more, Laughlin, Nevada was rated Number One in a recent, reputable, nation-wide, customer satisfaction study. The resorts in Laughlin topped the nation-wide list, due to a higher recognition of value for the money. 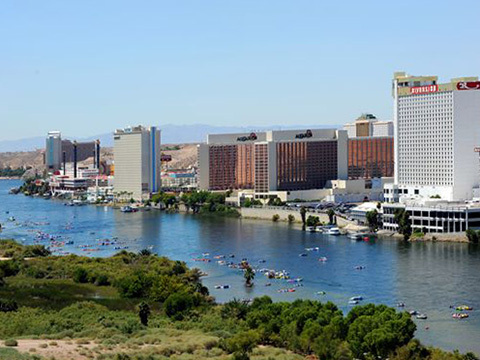 For those of you looking for some fun on the water, the Laughlin Dragon Boat Festival and APBA Powerboat Racing's "Laughlin River Days" are two spectacular events for participants and spectators alike. The Annual Chef's Food Fest allows event goers to sample the river's finest culinary artisans and the Bullhead/Laughlin Colorado River Bluegrass Festival brings the country's top musicians to town for a weekend of American culture. Rodeo enthusiasts and even first time spectators will enjoy the Laughlin River Stampede PRCA Rodeo, the United States Team Roping Championship, and the Laughlin Professional Bull Riders "Built Ford Tough" Series. All featuring the best amateur and professional riders in the sport. Finally, the Laughlin River Run and the SCORE Series "Laughlin Desert Challenge" will satisfy the need for speed, rock~n~roll and adventure for every Harley and off-road rider in the region. Visit the Laughlin Chamber of Commerce's website (www.laughlinchamber.com) for more information about relocating to our community.